One of the greatest concerns people have during an emergency situation is how to get the best food for survival. In this post, I’m going to talk about one particular way you can prepare now to have continuous healthy food to eat during an emergency. Because there are so many different reasons an emergency may happen such as natural disasters, war, economic collapse.. etc, there is no way I can claim that this is the best method for you. Many people will stockpile buckets of rice, beans and grains which is great, but the only problem is that you may run out and then what? Depending on the type of situation you are in, you many need food for months or even years. 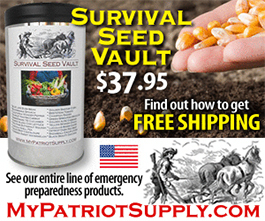 Do you have a long-term plan for food survival? To get the best food for survival, you need to have healthy and nutritious food. This is much easier for those of you who have some extra yard space where you can buy a couple fruit trees such as apple, pear or whatever grows best in your area. Depending on where you live, you can only grow certain types of fruit. Here’s a great resource to help you find what to plant in your area and when to plant them. Next, you need to buy some non-hybrid vegetable seeds. These are seeds that have not been changed for generations and you can keep their seeds every year and replant them forever. Even if you don’t have space in your yard, you can grow some small vegetables inside your home. I am currently in the process of starting my own raised garden bed in my backyard using many different types of seeds. Here are some common vegetables you may want to grow. ALWAYS remember that if you are going through some sort of a global or national crisis where there is little chance you will get help for a long time, then you will need to barter. Having fresh fruits and vegetables will allow you to trade for other things you may need without sacrificing items that you simply can’t give up. Keep this in mind and buy some extra items now that will allow you to easily barter such as alcohol, cigarettes, coffee and tea. These items will have great value.